Ohh soo close J, Christmas is only 2 sleeps away. You would think I would be tired of making Christmas card but nope. This is a bit of a sappy card, after all Love is the greatest gift of all. I used a simple layout, I printed the sentiment from Word then used a die to cut it out and popped it up with foam tape and added some ribbon. 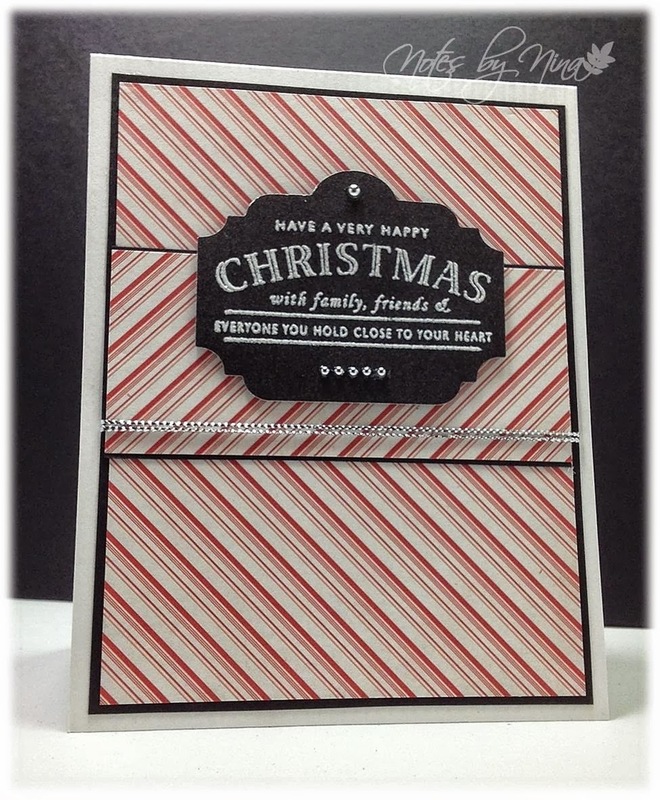 To cover the seam between the DP layers I twirled the same silver ribbon into a thin rope and glued it in place. I used a die to cut out the hearts and they are also popped up with foam tape. I then used to foam tape to pop up the layers off the card base. 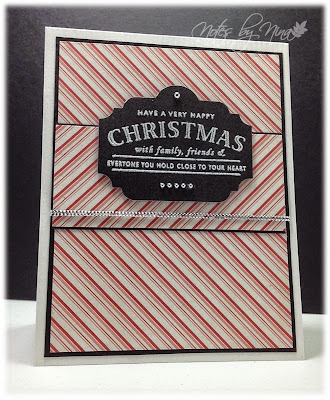 Supplies: Natural White, Silver and red card stock, Designer Paper –Bazzill Basic, Simon Say-Die Cut, Inspired by Stamping Die Cut, ribbon. A quick card for today, I have not been able to craft much this week. Work has been crazy and by the time I get home my brain is pretty much fried, does not do well for creativity. 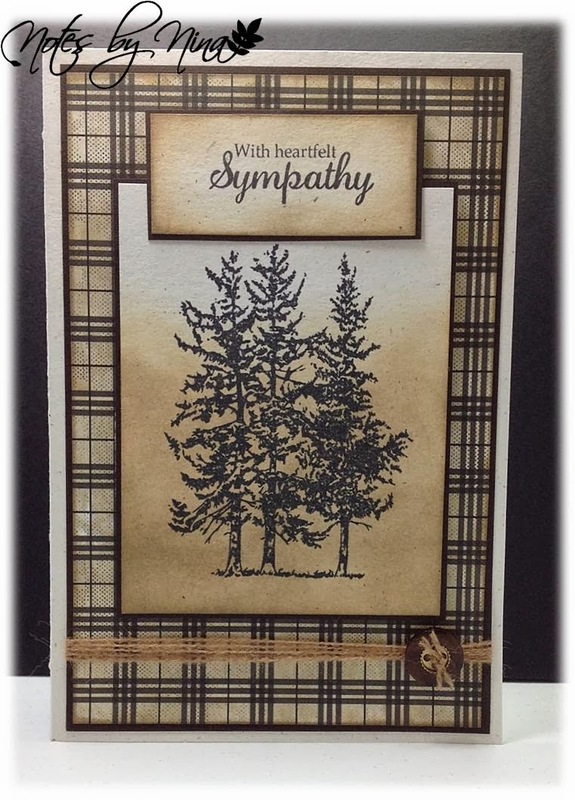 It is always sad when I need to make a Sympathy card, for this one I went with a masculine theme. I also made it a little larger in size so that it can be signed by a number of people in a office. 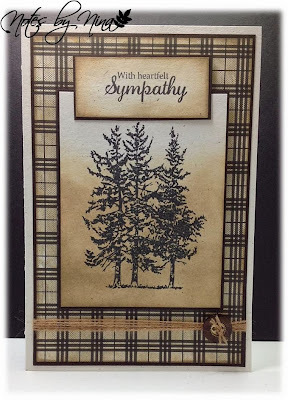 I inked the edges of the center panel with a number of distress inks then stamped the tree in black, I did the same with sentiment. I popped both panels up with foam tape themnfinished with some twine and a button. Supplies: Cream and brown card stock, Designer Paper - Unknowns, Stamps - Technique Tuesday, twine, button. Holy smokes we only have a short time till Christmas... are you ready?? 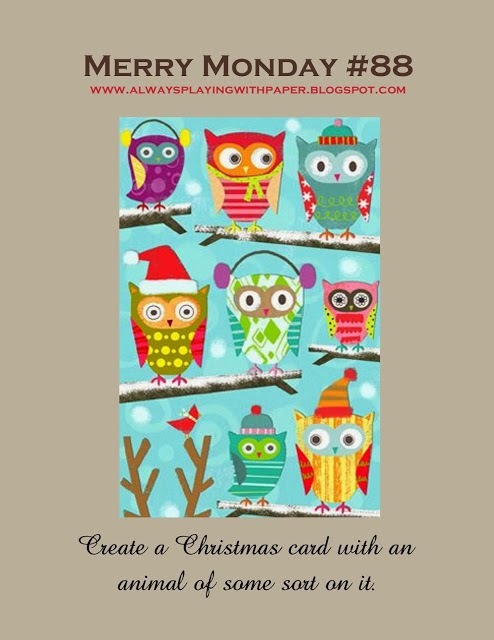 We have a new Merry Monday Christmas Card Challenge, and Lesley's has an adorable inspiration image for us today. Isn't this little guy cute, he is all glittery as I used my clear star glitter pen to add sparkle. I fussy cut the scarf from DP and used a water colour pencil for the sled and popped it up over the hills. I heat embossed the sentiment and popped it up with foam tape. I finished with some twine. 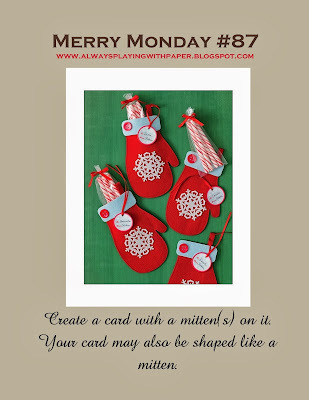 Supplies: Natural white and red card stock, Designer Paper-Bazzill Basics, Lawn Fawn-Winter Bunny stamp and die cut, twine. 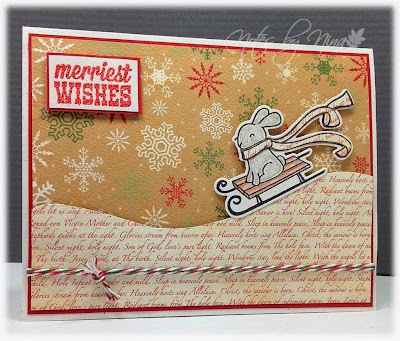 Stop by Lesley's blog and see what the Design Team has created and play along with us for Merry Monday. I had such fun making this card, I needed something unique for my hairdresser. 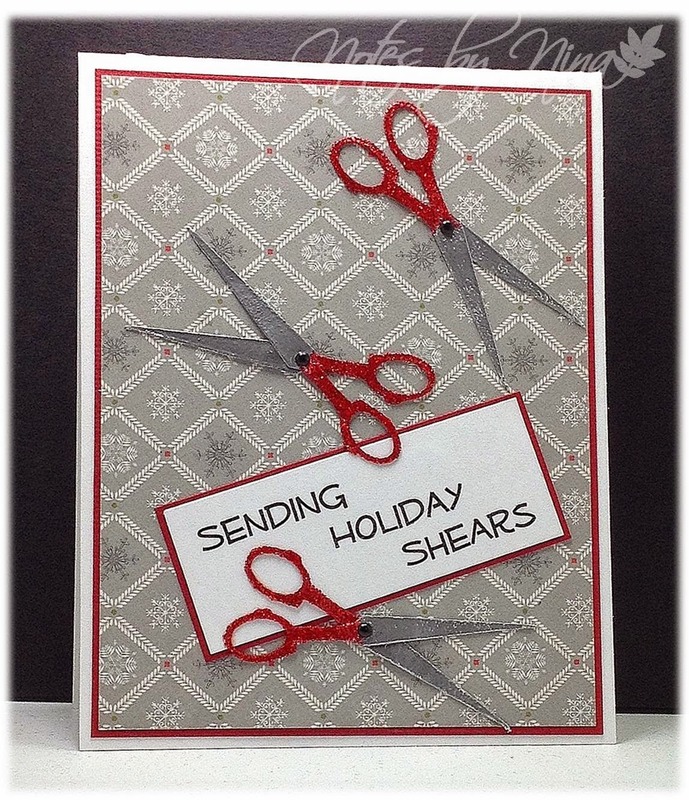 I started with a Silhouette cut file for the shears that was designed by my sister Barb, I used embossing powder to add silver and glittery red for the blades and handles. I printed the sentiment from Microsoft Word. 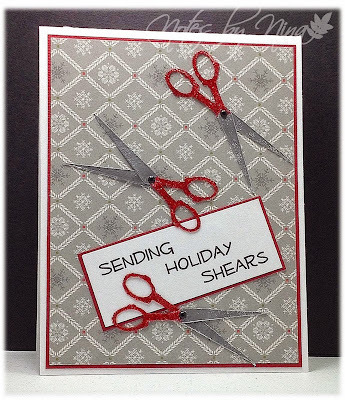 Supplies: White and red card stock, Designer Paper - Echo Park, Shears - Barbara Derksen Font - Mufferaw, mini brads. 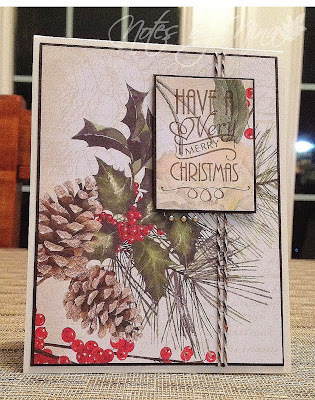 I cased my own card for a CAS quick card, I had the scraps hanging around so it made sense. I used simple layers and this pretty DP, unfortunately the scraps did not have any of the gold foil on it but I was still happy with the card. I used a different sentiment and added gold pearls rather than brown. 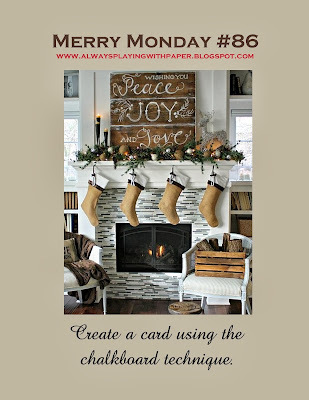 Christmas Card Challenge #3 and the challenge is to Make words the Focal Point. 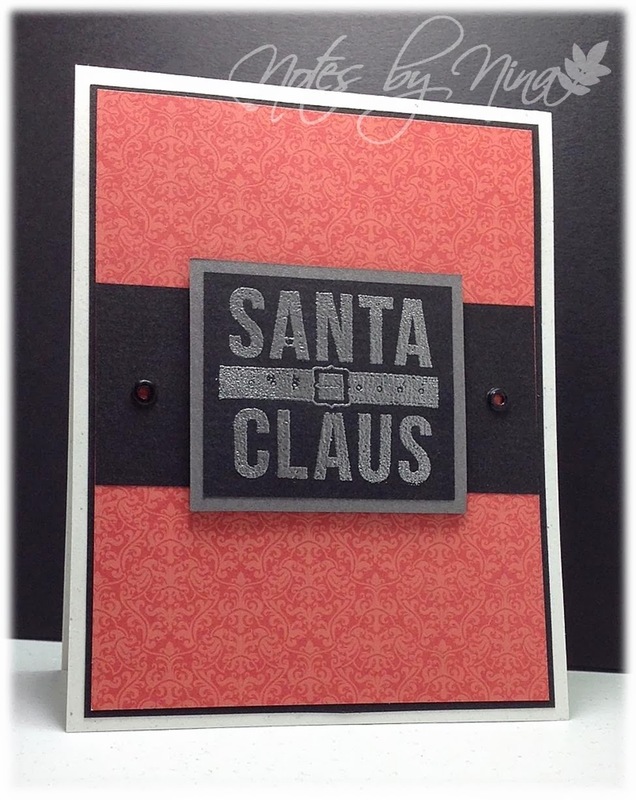 I have enough Christmas cards but I am still feeling in the festive mood, so I created a Santa Clause like card. I used simple layers then added a couple of eyelets, I used the sentiment for the belt buckle. 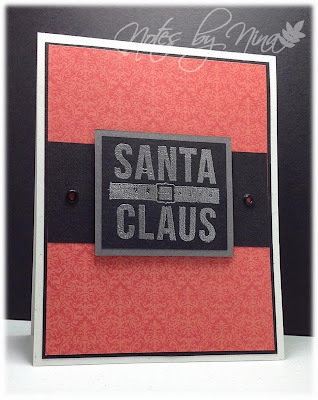 Supplies: Natural white, silver and black cardstock, Designer Paper - Echo Park, Momenta - Santa Claus, eyelets. We were in Vegas this past week for vacation, although it was sunny it was chilly and freezing temps for extended time. 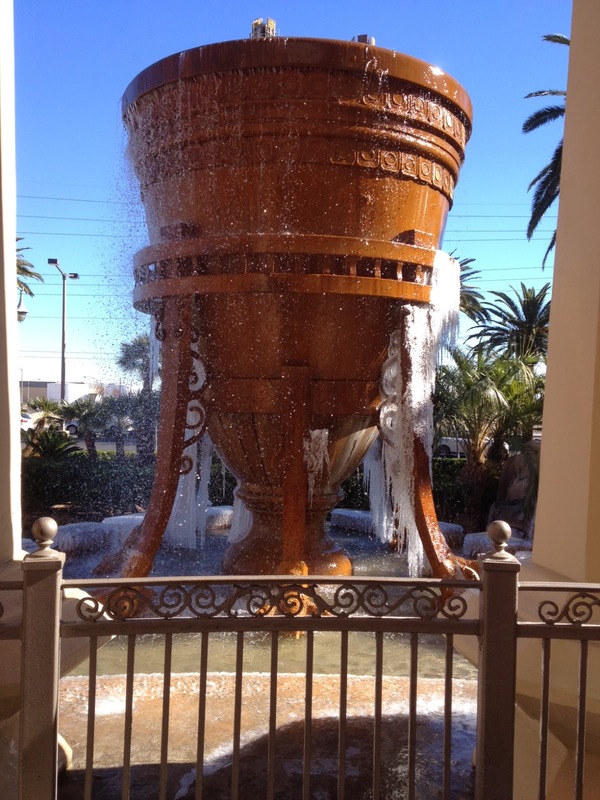 It was definitely different to see water on attractions like this one with icicles. Happy Monday, it is time for a new Merry Monday Christmas Card Challenge, and Lesley's has a fun image for inspiration today. I am happy to admit that all my Christmas cards are done, ahh the perks of challenge that has you making holiday cards throughout the year. 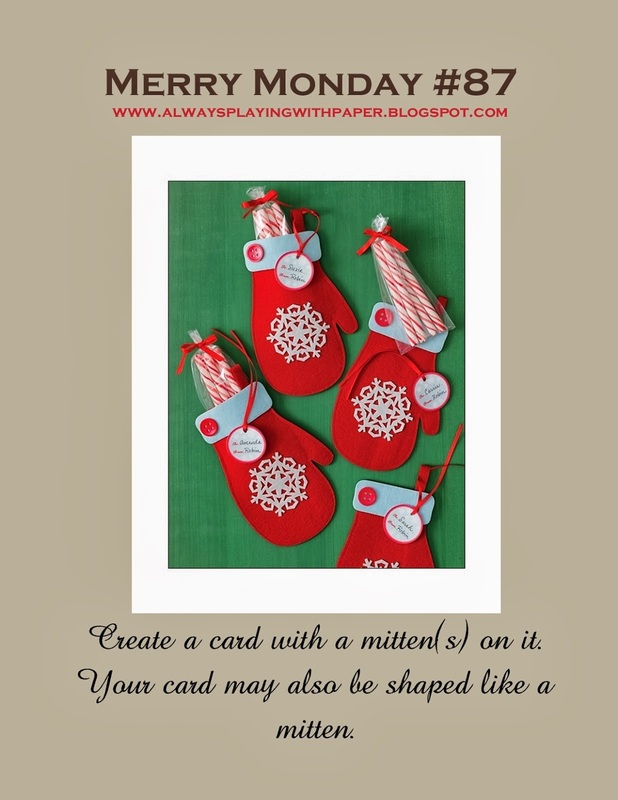 I love this card, the mittens are so cute and I smiled the whole time I was putting it all together. I grew up in a small town in BC, we had great winters that had more outdoor activities than indoor. I guess that is because we had 2 TV channels and a good snow usually knocked out the connection high in the mountains and it could be a good stretch before it was repaired. 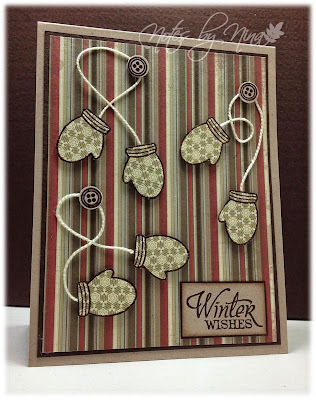 I created the background layers and then heat embossed the mittens and fussy cut them out, I added some cream twine and popped them up with foam tape. I heat embossed both the buttons and sentiment too. 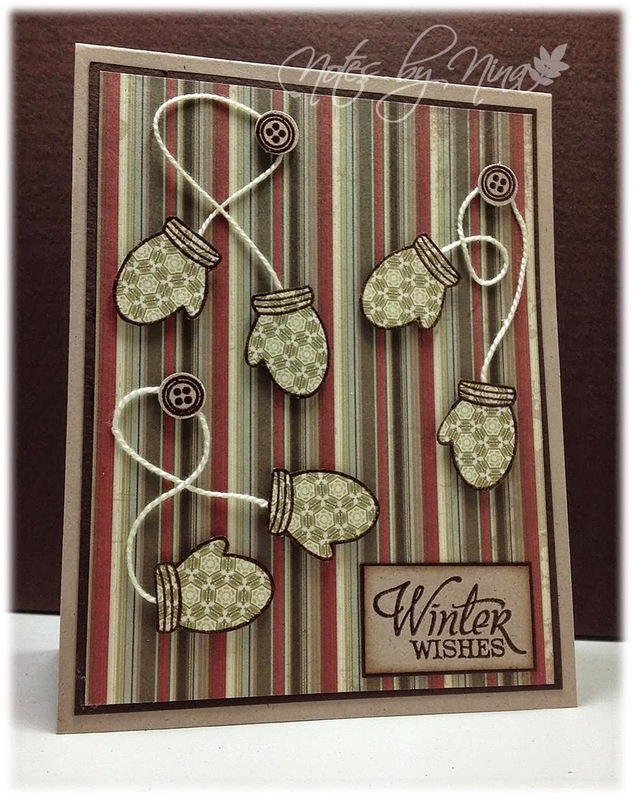 Supplies: Kraft and brown cardstock, Designer Paper -Kiaser Craft , Verve - Winter Mittens, circle punch, twine. 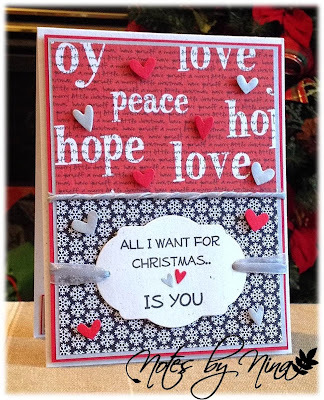 Stop by Lesley's blog and see what the Design Team has created and play along with us. 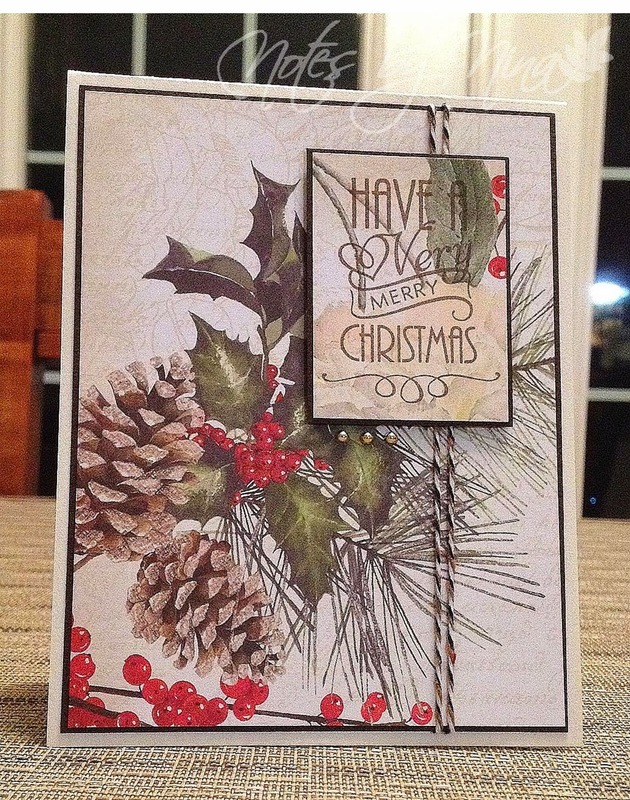 It is time for a new Merry Monday Christmas Card Challenge, and Lesley's has another lovely image for inspiration today. I have had all the supplies to create something using the chalkboard technique for a while but I have not used it much. As I created this simple card I wondered why not because I love how it turned out. I embossed the sentiment on chalkboard cardstock with Winter Wonderland embossing powder which is white with specs of silver. I added some silver twine and silver gems to finish. Supplies: Natural white and black card stock, Designer Paper-Echo Park, Woodware - Heartfelt Christmas Wish, twine, gems, embossing powder. 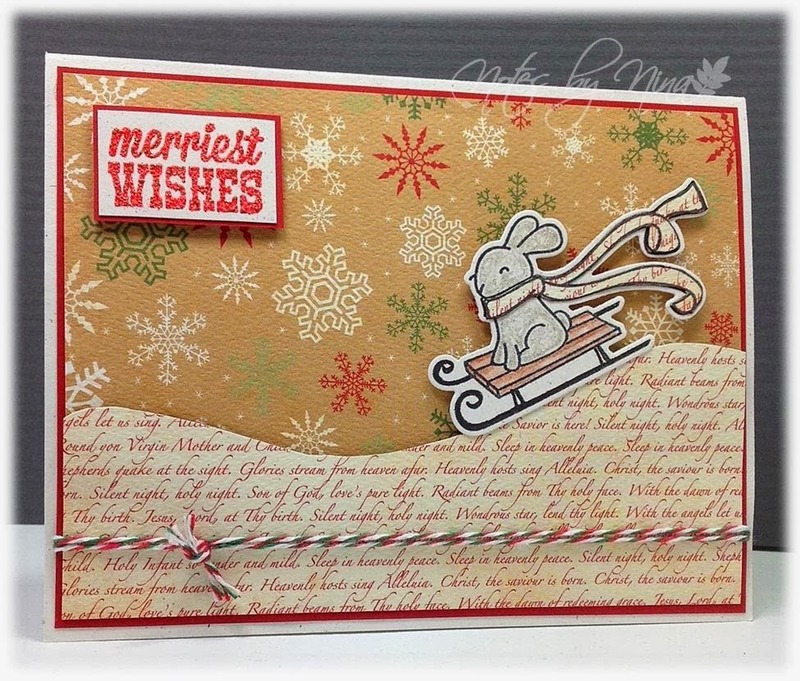 Stop by Lesley's blog and see what the Design Team has created and play along with us for Merry Monday this week.